We are entering upon our sixteenth year, and I feel it is cause for gratitude that our affairs are in such a healthy condition. Our meetings have been well attended, and the interest shown is such that we should be encouraged, and feel that our efforts to create a spirit of love for our town and a desire to study its history have not been altogether in vain. We have recently obtained from the Selectmen a two years' extension of the lease of this house, and we trust that the sentiment of the town will continue in favor of our occupation of it. During the past year seven of our members have died and five have removed from the town. Our present membership is as follows: 4 benefactors, 25 life members and 192 annual 'members, making in all 221. Members should all strive to increase the membership, particularly among the younger people. The members who died during the year were: Jacob P. Bates, died April 15; Alexis H. French, died May 3; Theodore L. Keppler, died May 24; Mrs. Susan Vining Griggs, died May 25; Edwin P. Bowker, died Nov. 23; Mrs. Sarah E. M. Guild, died December 20; and Rev. William Henry Lyon, D.O., died December 20. Jacob P. Bates was of the well-known firm of Cobb, Bates and Yerxa of Boston. He came to Brookline in 1883, and built a fine house on Longwood Avenue, near St. Paul Street. He was prominent in the Harvard Church, and was for many years a member of its Prudential Committee. He represented the town for one year in the Legislature, and was one of our best known and respected citizens. He was a large donor to the new building of the Boston Y. M. C. A. Alexis H. French was for many years the Town Engineer. He was born in Weymouth, and came to Brookline in 1872. He had just graduated from the Institute of Technology, and he worked at his profession under Mr. George Tyler, who was at that time Superintendent of Streets. He afterwards formed the partnership of French and Bryant, civil engineers, who worked for private parties and for the town. When the town engineering department was established he was appointed as its head, and gave up his connection with Mr. Bryant. Mr. French was a member of the Appalachian Club, and at one time its president. He was a skilful photographer, and had a fine collection of views. He frequently attended our meetings. For more than a year he was prevented by sickness from attending to business, or to any activities. Theodore Keppler came to Brookline in 1909. He was the superintendent of the South Boston Sugar Refinery. Mrs. Susan Vining Griggs was the wife of one of our oldest citizens, Thomas B. Griggs, and for several years she was an active member of our Society and one of its officers. She wrote a paper on the Griggs family and the Edward Devotion House, in which she was greatly interested. She was a fine musician and was a member of a musical club. She was also much interested in the society of the Daughters of the Revolution. Edwin P. Bowker came with his father, Watts H. Bowker, to Brookline from Machias, Maine, about 1875. His father, who was also a member of the Society, contributed a paper on the history of his native town. Edwin was associated with his father in business and of late years was occupied with the care of his father's property. Mrs. Sarah E. M. Guild was the widow of J. Anson Guild, who for many years was a Brookline business man, coming from Dedham in the early fifties. He entered the employment of Jerathmael Davenport, whose store was on the present site of the grain store of Whittemore Company. Mr. Davenport was a familiar character in the town, and was for many years one of its Selectmen. He built the house on Elm Place, or Village Lane as it was then called, which afterwards passed into the possession of Mr. Guild. Mr. Davenport died in 1862. Mr. Guild succeeded him in business, and built in 1867 the block that bears his name. He established there the business which' under different names continues until this day. Mr. Guild was much interested in town affairs, and was an assessor from 1879 to 1899. Rev. William H. Lyon, D.D., was the revered and beloved minister of the First Parish, and came to its pulpit in May, 1896. He was born in Fall River, was graduated from Brown University and from the Harvard Divinity School. His first parish was in Ellsworth, Maine. From there he was called to the Unitarian Parish in Roxbury, whose church was then located at the comer of Dudley and Greenville Streets. Many of its parishioners moving away and the character of the neighborhood greatly changing, a new stone church was built on Elm Hill Avenue, comer of Warren Street, Roxbury. Here Dr. Lyon established a strong society. In 1896 he was called to Brookline, where he already had many wann friends, he having been connected with the Sunday School while he was a student at the Divinity School. He took a very active 8 part in the affairs of the parish and of the town, and was at one time a member of the School Committee and of the Brookline Educational Society. At the time of his death he was a trustee of the Public Library. He was much interested in historical matters, and wrote a paper on the Goddard family, and a history of the First Parish in Brookline. There have been eight meetings of the Society during the year: five in the Devotion House, two in the hall of the Public Library, and one in the Grand Army room of the Town Hall. The annual meeting was held on January 20, at which the officers were elected and the annual reports were read. In the hall of the library, on February 15, Mr. Edward W. Baker gave a talk about "Brookline, Ancient and Modem," illustrated with lantern slides. This was a gala night for the Society. The hall was crowded, although the evening was rainy, and we had a most interesting review of the growth of Brookline, with views of numerous old houses, many of them now destroyed. Mr. Baker also gave views of some of the great changes in the town, particularly on the line of Beacon Street and about Coolidge Comer, and of some of the large estates and gardens in the south part of the town. The talk and views were greatly enjoyed, and the whole town is indebted to Mr. Baker for the great pains he took in getting together such a mass of information and instruction. He has several times been called upon to repeat his lecture before other societies. On March 24, at the Devotion House, Anson M. Lyman, Esq., read a paper entitled "Literary Qualities of the Bible." Mr. Lyman showed that the Bible, aside from its religious inspiration, is a wonderfully written book, and outranks even Shakespeare in its fine literary qualities. He showed an intimate and appreciative knowledge of the Bible, and his paper was an admirable one. Mr. Lyman had read this paper before the Thursday Club, and it had also been given at a meeting of the First Parish Club. At the Devotion House, on April 14, Mr. Charles F. Read gave a paper entitled "A Boy's Memories of the Civil War and the Assassination of Abraham Lincoln, together with Extracts from a Contemporaneous Diary." As this was the fiftieth anniversary of President Lincoln's assassination the paper was most timely, and it brought back to those of us who could remember that eventful morning, when the whole world was informed of the dastardly deed, the sorrow of the country and the horror of such an inhuman murder. May 28 was "Grand Anny Night." As has been our custom, this meeting, coming so near Memorial Day, was held in the Grand Army Hall, and Mr. Alphonso S. Harris, a soldier in the War of the Rebellion, and a member of our Society, spoke on "Some Personal Recollections of the Civil War, by a Participant." The talk was informal and very interesting. Several of the old soldiers were present. Then followed the Summer Vacation. On October 20, at the Devotion House, Mr. Charles F. Read, who has so often favored us with his interesting papers, gave a paper on "Impressions of a Transcontinental Tour, and the Panama-Pacific International Exposition," illustrated by the reflectoscope. Mr. Read gave us numerous views and descriptions of the different cities and states visited, and of the exposition. The upper room of the Edward Devotion House was filled, and we had a most enjoyable evening. November 17. Hon. W. Prentiss Parker gave us "Views and Talks on Historical Houses in Eastern Massachusetts." The lecture was in the hall of the Public Library, and it was of great interest and enjoyment. Most of the pictures were of old houses in Roxbury and Dorchester, some of them now tom down; and Mr. Parker's descriptions showed a great deal of research in their preparation. As one rides through the streets of Roxbury and Dorchester, seeing rows of apartment houses, it is hard to realize that, within the memory of one generation, in their places were these old houses and their farms. December 22. Rev. E. Tallmadge Root of Somerville read a paper entitled, "Church and Town in New England." Mr. Root is officially connected with the Massachusetts Federation of Churches and has had abundant opportunity of knowing the conditions of the churches in many New England towns, and he related some most interesting facts. At its close Mr. Edward W. Baker showed some old documents from the town clerk's office, relating to the time when the town and the parish (now the First Parish) were one. The meeting was held in the kitchen of the Edward Devotion House. The meetings have been well attended, the papers well received, and much interest shown. Brookline continues to grow, and the amount of building during the past year has been large, notably the three-apartment brick houses north of Coolidge Corner and on Longwood Avenue, and the two family frame buildings, covered with concrete, on Winthrop and University Roads and elsewhere. The town was wise in stopping the building of three-story wooden apartments, known as "three-deckers." A notable event of the year has been the finishing and dedication of the Soldiers' Monument. For many years at intervals the question of a monument has come before the town strongly urged by the members of the Grand Army; but the sentiment of the citizens at large has been against it, partly no doubt on account of the many rather commonplace monuments in various towns and cities; but in the spring of 1913 the demand for a monument was so strong that an appropriation of 140,000 for the purpose was made, and on the ninth of October, 1915, the monument was unveiled and dedicated in the presence of a great crowd of citizens. Although it was fifty years after the close of the Civil War, it was well that the town had waited so long and was thus enabled to erect so fine a memorial to the soldiers who gave their lives for their country. No description of our monument is needed; it stands there in the grounds of the Public Library, under the beautiful willow tree, which seems reaching down to embrace and protect the stalwart young bugler on his spirited horse. The dedicatory exercises have been so well described, and were so well attended, that it is only necessary to recall this happy event in our town annals. Patriotic and inspiring addresses by the Governor of the Commonwealth, by the Chairman of the Board of Selectmen and others, marked the occasion; and the singing of the children, the music by the band, and the bright skies of the lovely autumnal day made it an event to be long remembered. Within the year a most interesting experiment has been initiated which will have its first trial at the coming spring election, it being what may be called a plan for a Representative Town Meeting. Our voting population now being nearly six times the capacity of our Town Hall, it is obvious that only a small proportion of them can be accommodated at the meetings there. Alfred D. Chandler, Esq., one of our best known citizens, has formulated a plan by which the town is divided into nine precincts, each of which contains approximately 650 voters, who shall vote for twenty-seven of their number to represent them in the town-meetings. All the voters will still be entitled to vote by ballot in elections, but only the town-meeting members may vote on the various measures presented at town-meetings, including appropriations. It is a novel scheme, and its workings will be watched with interest by other large towns. Already there is much interest shown, and a desire to be elected a member of the town-meeting representatives. It is interesting to note the gradual growth of the business part of our town. Prior to 1857 whatever business was carried on was almost wholly below what is now the bridge in the village. 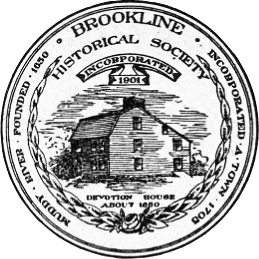 The grocery , the little dry goods store under Lyceum Hall, the Post Office, and blacksmith's shops, were centered in a little group at Brookline Avenue and the beginning of Boylston Street. In 1857 the Coolidges built the store where the S. S. Pierce Company have their large establishment, but for nearly forty years it stood alone without any perceptible increase of business. The widening of Beacon Street, and the beginning of the apartment house growth, made a demand for business, and stores began to be erected about the corner; but the increase within the last five years has been phenomenal. Meanwhile the stores in the village section have been creeping up Washington and Harvard Streets, the large increase in the number of dwelling houses having created a demand for them. The Harvard Church, or as it was formerly called, the Orthodox Church of Brookline, and the Second Universalist Society of Boston have agreed to worship together. The Harvard Church is building a large addition, and the Parish is by far the largest Protestant society in the town. The Second Unitarian Society is building a well-designed brick church on Charles Street, which will be connected with its present Parish House on Sewall Avenue. There have been four meetings of the Bay State Historical League, of which our Society is a member, viz: January 16, at Milton; April 10, at South Framingham; June 12, at Plymouth; October 30, at Billerica. These meetings have been attended by one or more delegates from this Society. Your President has attended several of these meetings in past years, and he thinks that our Society should feel happy in having such a pleasant and fitting place to meet in as the Edward Devotion House. The Lynn Historical Society and some others have houses of their own, but most of the societies meet in halls or in the vestries of the churches.